The Leaf Wetness Smart Sensor provides accurate leaf wetness data in a number of growing and research applications. The sensor is ready to use and does not require any painting or coating. The Leaf Wetness Smart Sensor provides accurate leaf wetness data in a number of growing and research applications. The sensor is ready to use and does not require any painting or coating. It uses a capacitive grid that is less sensitive to surface residues than resistive grid-based sensors, and comes preconditioned for consistent measurements between sensors and for long-term stability. 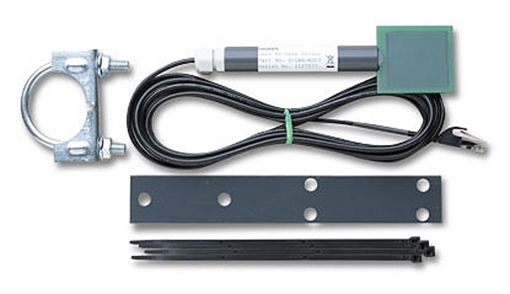 Along with a 3-meter cable, a mounting bracket is included so the sensor can be easily positioned to mimic the wet-dry characteristics of the plants being studied. For mounting on Onset tripods or masts 3.2 cm to 4.1 cm (1 1/4” to 1 5/8”), Cross Arms (Part # M-CAA or M-CAB), or flat surfaces. U-bolt and tie-wraps included. 15 Channel Energy Monitoring and Weather Station - The HOBO U30-NRC Weather Station is our most rugged data logging system that can be easily reconfigured and adapted to a wide variety of applications. The HOBO RX3000 is Onset’s next-generation remote data logging station that provides instant access to site-specific environmental data anywhere, anytime via the internet.